Where to buy a cyr wheel / roue cyr / simple wheel. Do you want to buy a cyr wheel? Here is a list of all the known retailers/manufacturers. There is no particular order to people in the list, and people will ship worldwide. Check out my video of my LED Cyr Wheel — and support my website by clicking on ads! Sam Tribble – Spinnovate.me – based on Orange County, California. Contact information for Sam. Sam uses solid aluminum inserts, or zinc plated steel (zinc plating prevents corrosion and is essential for differing metals). Sam can do light weight 3-piece wheels and 5-piece wheels. The screws can be on the inside diameter of the wheel, or on the edge. Same has been making wheels for a long time, and produces very strong wheels. I personally know Sam and he does good work. Hugo Noel / Circus Concepts – Canada. circusconcepts.com. Huge has been making wheels a long time, and they are good quality. I believe he uses steel inserts. Has some great information on sizing (check out his site just for the sizing information alone! ), and a few different options for wheels at various prices. Hugo’s new wheels have mix and match inserts, which is great if a piece or insert breaks. He also now sells LED Cyr Wheels, with LEDs on the inside circumference of the wheel. Backstage Fab: Randy Hernandez – Florida – http://backstagefab.com/CustomWheels.html — I haven’t seen their wheels personally and don’t know much about them. But they look pretty. Aluminum wheels with steel inserts. Daniel Cyr: – Canada. 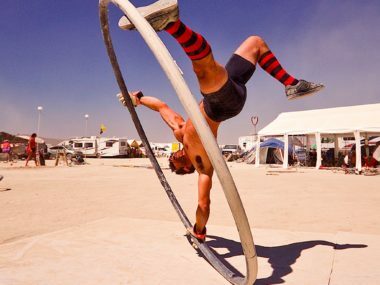 http://www.cirque-eloize.com/en/who-are-we/the-cyr-wheel — The originator of the cyr wheel, as we know it. I’ve heard he may not be making wheels anymore. RB Workshop: Canada. http://ateliersrb.com – Located in Quebec – word is they have good wheels, but I haven’t seen them. The man who makes them has a daughter (Valerie Inertie) who uses his wheels, and has been doing high level cyr wheel work for many many years, so I’m sure they are well made. Coggs Circus – Atlanta, GA, USA.http://www.coggscircus.com/cyrwheel/ – I haven’t seen these wheels personally. Prices are listed on their site. Bill Roberts – Florida, USA.Cyr Wheels on Etsy Site – Bill is relatively new to the cyr wheel fabrication scene, but he has many many years of metal working experience. I know he has been churning out a lot of wheels, and they look pretty good. Cyr Craft – Jesse Hughson – New York, USA. http://cyrcraft.com – formally called Full Circle Forge: http://www.fullcircleforge.com – Jesse is pretty new to making wheels, but has produced a lot of them. Here is his etsy page. He is also prototyping LED cyr wheels, and has them listed for sale. Juggle Gear: Calgary, Alberta, Canada, with resellers in the UK, Italy and Australia. http://www.jugglegear.com — From Peter Van Thiel on Facebook: “alum wheels 1.5″ tubing with PVC cover & alum inserts, weight 11.5 – 13 kg depending on size, CNC manufacturing and accurate mix and match inserts.” Contact them for the closest re-seller to you. FireToys: United Kingdom. http://www.firetoys.co.uk/balance-props/cyr-wheels-german-wheels.html — They are a reseller of Juggle Gear wheels in the UK. Zimmermann – Germany. http://www.rhoenradbau.de – I’ve seen these wheels; they are built like German wheels, and usually are a thin steel wheel, with a white PVC coating. Based on my ~2011 experience, I feel like they are too heavy, and the inserts are too short, causing them to come loose (my opinion may become outdated as they improve their wheels). Zimmerman has been making German wheels for a very long time, and is definitely the go to person for them. Contact them for quotes. La chose – Belgium. http://www.lachose.be – Recently mentioned to me as a European maker of cyr wheels. Steel tubing, 3 or 5 pieces, 40mm final tubing diameter, weight 15-16kg depending on size. Anton Soskov: Ukraine, will ship anywhere. https://www.etsy.com/shop/CyrWheel – The wheels are well priced. Also has cyr wheel bags. He makes aluminum, stainless steel, and titanium wheels, and uses a standard 4 bolts per connection. Also has UV PVC covering that glows in the dark. As of September 2017, Anton also has LED cyr wheels: two or three grooves with APA 102 LEDs at 30 or 60 LEDs per meter. Denys Proskura: Kiev, Ukraine: http://denysproskura.com/index.php/en/cyr-wheel – Aluminum wheels with PCV covering — they have various PVC colors. Octopus Cyr Wheels: http://ambro2000.wix.com/cyrwheel – Laze v Tuhinju, Slovenia. Octopus Cyr Wheels Website link on etsy. Aluminum wheels with what looks like aluminum inserts, and PVC covering. My recommendation on what to buy: Purchase a 5 piece wheel that is painted and skinned. Painting (or anodizing, or powder coating) is required, otherwise the PVC skin on the wheel will prematurely come loose — even aluminum will oxodize. Wheels are made of either aluminum or steel (or titanium! ), and are skinned with a PVC (plastic) covering. Personally, I feel like aluminum is better, because I like light wheels. A 3 piece wheel will also work, and are generally lighter. However, a 5 piece wheel is much more portable, and usually heavier. Heavier is easier for beginners, and weight of the wheels is usually a very personal preference. Inserts are used to assemble the wheel. Inserts can be made of aluminum or steel. Steel inserts in aluminum should be painted, anodized or zinc-plated to avoid corrosion, although this may not entirely be necessary as I have used raw steel inserts in an aluminum wheel without any problem. Wheel thickness is usually 1.5″ diameter tubing plus ?” to 3/16″ thickness PVC covering (a skin) bringing it to 1 3/4″ or 1 ?” total diameter. Smaller diameters are possible for lighter and smaller people. The inner diameter of the wheel should be 2-3″ taller than your height. Hugo’s site has a great description on sizes here. Contact me if you want me to add your company or name to this list.